Let's just get to it, shall we. Cyclists are not random boxes of corn flakes that you store up on a shelf, out of sight - out of mind. They are urban citizens contributing as much as the next - often more - to urban life. Like pedestrians and public transport users, they are best served at street level as integral threads woven into the rich urban fabric to contribute to the beautiful complexities of city life. Anthropologically, socially, financially. For over a century we have understood the necessity of Best Practice infrastructure. We have tried and tested it with hundreds and hundreds of millions of people - and perfected it. We have measured and gauged it in order to understand it. We have regarded it as a beautiful, functional thing and designed it accordingly. For 7000 years we have lived together in cities, on equal footing. In the splendid democracy of urban space. The streets were the most democratic spaces in the history of homo sapiens. Super Bicycle Snake planned for Chinese city Xiamen. Which makes this new project by Danish architecture bureau Dissing+Weitling for the city of Xiamen look completely ridiculous. An eight kilometer long shelf designed to place cyclists out of sight and out of mind. This is what happens when architecture gets drunk at the christmas party and sleeps with car-centric engineering, without listening to the wise advice of urban planning and anthropology. British architect Norman Foster amused us back in 2014 with his plans to shelve cyclists in London with his ridiculous SkyCycle project. Other plans for bicycle "infrastructure" in London were equally amusing in this 2015 article. 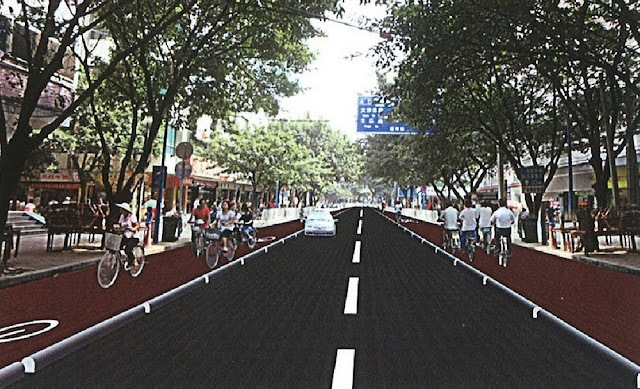 "Xiamen's broad boulevards are reserved for automobiles and they are life-threatening for cyclists. Therefore, the raised bicycle connection will be a welcome improvement of the city's infrastructure for cyclists", it says on the Dissing+Weitling website. This is the firm that designed the renowned Cykelslangen - Bicycle Snake for the City of Copenhagen. - an solution that fulfills all the requirements of Danish Design - functional, practical and elegant. The Bicycle Snake is a short, simple and brilliant solution to one unique location. There is nowhere else in Copenhagen where such a structure is needed. It is a perfect example of tactical, location-oriented design. And hey. Dissing+Weitling know bridges. They have been quite good at designing them - both for cars and for bikes/peds. Many are beautiful and their designs avoid the usual Squiggletecture we see emerging from the Photoshopped ideas of many others who don't understand bicycle urbanism. Using the basic concept of the Bicycle Snake to erase cyclists from the cityscape, however, reveals the complete disconnect between our struggle for creating better cities and the seductive, ego-enhancement of mega-projects. Rationality falls off the back rack. "There is still a massive potential related to spreading the humanistic, user-oriented approach to design that we take for granted in our modern, Nordic design tradition. Foreign clients really listen when we present them with our complete, well thought out solutions that often show great consideration to the people who will use the solutions - and that also combine functional, Nordic architecture". So sayeth Steen Savery Trojaborg, partner at Dissing+Weitling. You want to know where the potential is? In understanding urban life. Understanding a urban, human journey across seven millenia - as well as promptly rejecting outright the past century of car-centric thought - and applying that to our established designs. Fortunately, other Danish influences in China are rational and based on user-friendly designs, as we wrote in this article back in 2011, about Danish consultant Troels Andersen and his work in the city of Guangzhou. The city is planning 1000 km of bicycle infrastructure and greenways, including Best Practice designs like the curb-separated infrastructure pictured above. We had a look at the city of Xiamen here at the Copenhagenize Design Co. office today. To gain some context. According to the local media, the city is, like so many other Chinese cities, starting to take the bicycle seriously as transport once again. The city has 43 km of cycle track under construction around the lake - primarily recreational and therefore less relevant for transport. But as you can see on the map on the left, 107 km of bicycle infrastructure is planned in two phases on the island on which Xiamen is located. The proposed Bicycle Snake is highlighted in orange on the left and presented on its own on the right. 107 km is far from the 1000 km underway in Guangzhou or the proposed 3200 km (!) planned in Beijing by 2020 (!) but nonetheless positive. It really is what we're seeing all over the world. "The “Yunding Road” bike bridge is an attempt to popularize the bike life. 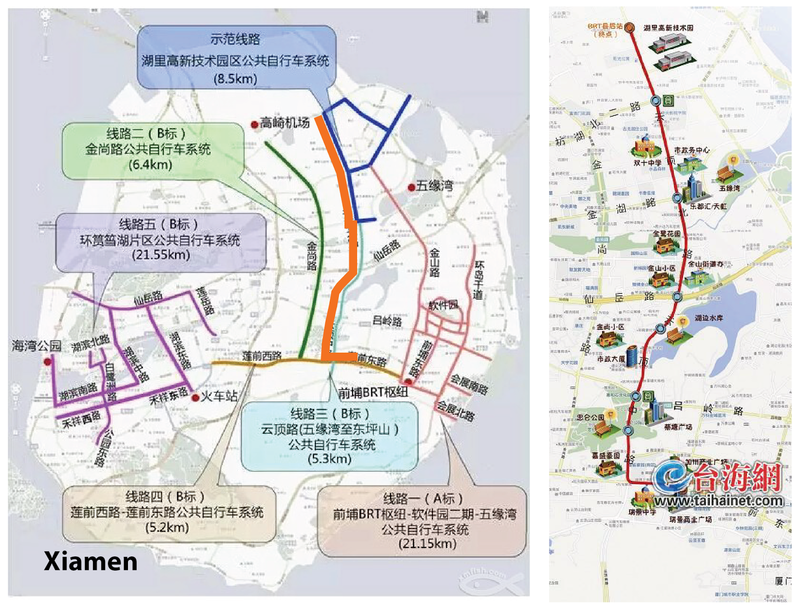 In the future we would combine the needs of the citizens, gradually implementing cycle tracks and other facilities in and outside Xiamen Island". So it reads a bit like a vanity project for the city. What an expensive route to take when your plan is allegedly to integrate the bicycle as transport properly "in the future". If, as Dissing+Weitling say, "Foreign clients really listen when we present them with our complete, well thought out solutions that often show great consideration to the people who will use the solutions" then get them to listen to rational ideas that actually make sense, benefit the citizens, the public health and expedite the transformation to a more liveable city where the bicycle is an equal partner in the traffic equation instead of designing Disneyland gimmicks for them. On this local forum, there are positive comments about the "Air Bicycle Bridge", which is how the project name translates directly from Chinese. - "If Xiamen succeeds, other cities will catch up, right? This is good news!" - "Green transportation is being pushed everywhere. I hope we can do more for bicycle development." There are, however, detractors. Giving us an insight into the background for this project. - "Us cyclists need basic rights and a good environment, not just one or two vanity projects. Who will maintain this facility?" - "Our government is rich and just wants to spend some money". The Bicycle Snake in Copenhagen is a project of visionary, iconic proportions and serves a functional, practical purpose. An eight kilometer long version in Xiamen is merely a vanity project for everyone involved. "Vanity working on a weak head, produces every sort of mischief". Jane Austen.